Every Montana Fish, Wildlife & Parks (MFWP) fishing access site and campground is shown! Forest Service and BLM sites also highlighted! Provides information critical to fishermen, including river and lake access points, plus shuttle services and fishing shops near where you plan to fish and more! MONTANA FISHING links fishermen to every USGS river gauging station in the state, making critical flow and temperature data available at the user’s fingertips! Provides the full set of Montana fishing regulations, as well as dates of MFWP stocking activities, including the size and number of fish stocked! No WiFi or cellular connection needed to use MONTANA FISHING! Why? Because fishing in our state often means being on the water, in wild country, with the nearest cellular (much less WiFi) service 3 counties away. So almost every aspect* of Montana Fishing works regardless if the nearest cell tower is 3 counties away. (*with a single exception--only looking at real-time USGS stream flow data requires connectivity). No separate map purchase required, nor do you need to download maps before you go! Boundaries for public and private lands shown. App is fully interactive and works with the smart phone’s GPS. Fishermen simply open the app and zoom to their current location. That makes finding stream, lake, or river access points simple, as is panning around to decide where to head next. Change your mind at the last moment? Doesn't matter, it's all here in the app! Arranged by MFWP's 7 regions -- just pick one, plus the info you want and go! In the top left corner choose the type backdrop map you prefer: shaded-relief or Google Earth. Tap to find your current location, or pinch/zoom or pan to explore areas where you might want to fish. 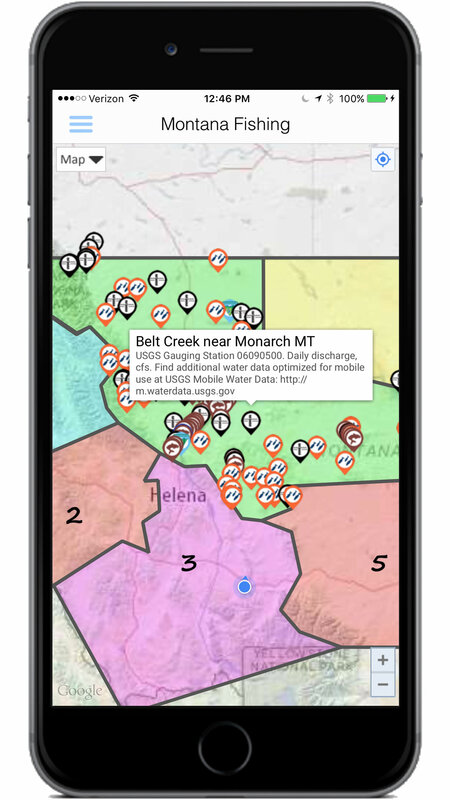 Tap icons to find USGS water temps and flow rates, MFWP fish stocking records, and more! COOL FEATURE: It’s designed to work offline except for real-time USGGS stream flow data. No time to waste when fishing. It’s not often that I don’t have my fishing gear with me, which can lead to me looking longingly at a nice little stream, wondering where I can legally access it. 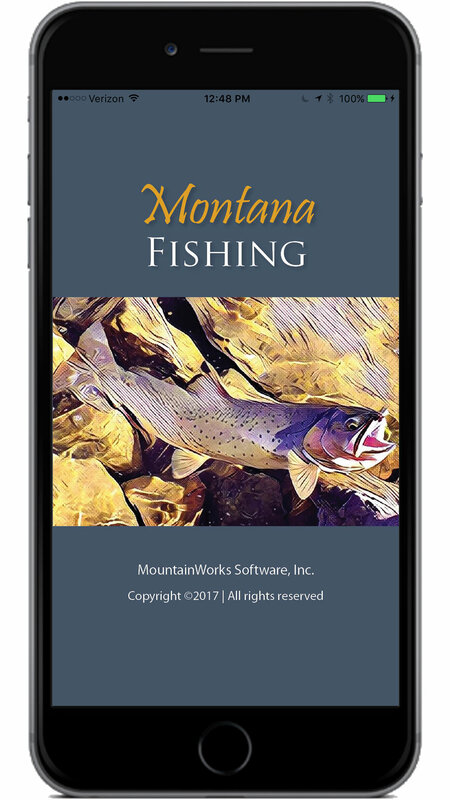 MountainWorks Software has eliminated that problem with the release of the Montana Fishing App. 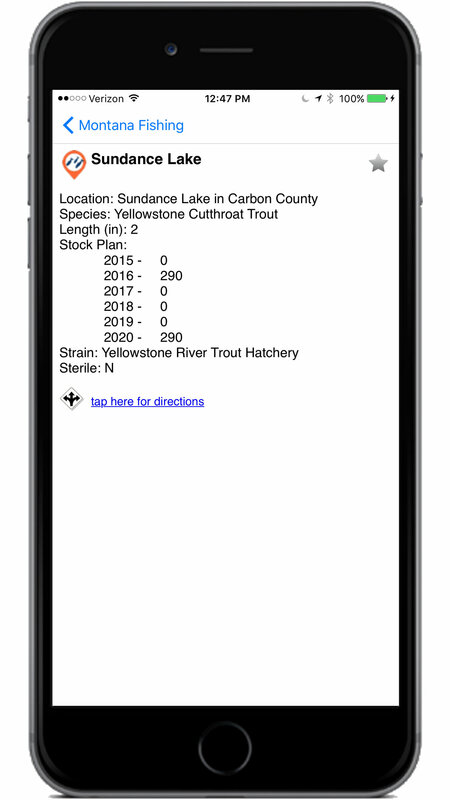 The amount of information available at one's fingertips is staggering: all Montana State Fishing Access Sites, FWP regulations, other fishing access sites (such as BLM or National Forest), shuttle services in the area, CFS and water temperature, fly shops, and even fish-stocking information for the lakes. All of this info has been readily available online; one just had to visit several sites to cultivate it all. Now I open the app, click the region I’m in, and it’s all right there—plus I can do it while looking at the stream I want to fish. A lot of the information is available even when I don’t have cell-phone coverage or WiFi. Available for $5 for both Android and Apple users. Some of us are just too darned “connected” these days, tied to our jobs even on weekends, holidays and vacations by cellphones — those mini computers that give us easy access to Facebook, text and email in addition to phone calls. So it’s kind of cool when your phone can unchain you a bit, set us outdoor-types free with information about an area where maybe those pesky text messages, emails and phone calls won’t intrude. That wasn’t the goal of Katie Gibson and Scott Bischke, a dynamic Bozeman outdoors couple, when they collaborated to create their new app called “Montana Fishing,” but I’m willing to overlook that oversight. Yet their knowledge of limited backcountry cell service in Montana is evident in the fact that most of the app’s information is accessible without a cell signal or Wi-Fi connection. 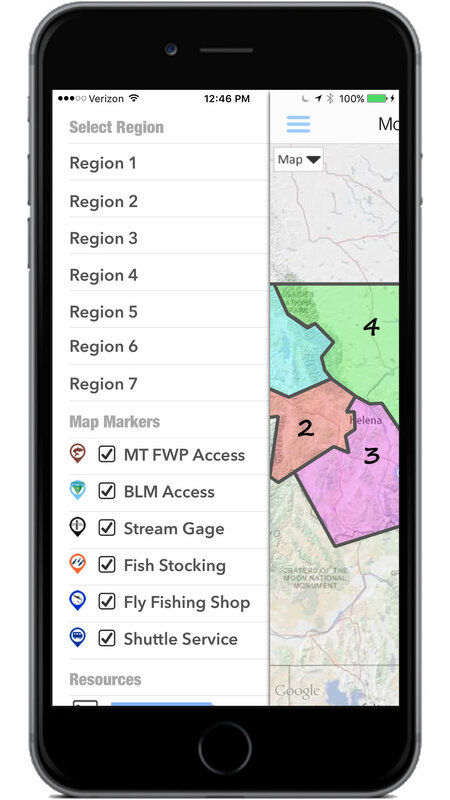 A husband and wife team who own MountainWorks Software in Bozeman have created an app to help anglers across the state find a place to fish or a fishing shop near them. Many mapping apps have trouble in the wilderness thanks to spotty internet access, owners Scott Bischke and Katie Gibson said. 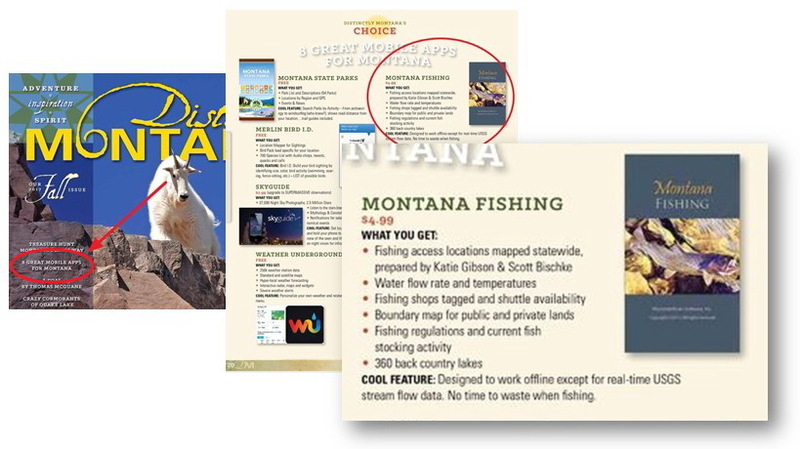 Their app, called Montana Fishing, overcomes that problem by making all its maps useable offline. With summer upon us, residents of the Flathead Valley are beginning to pursue their outdoor adventures in earnest, and while our Thoreauvian instincts tempt us to shuck off the constraints of technology, don’t underestimate the power of technology in the woods. A suite of handy apps for your smartphones and devices can help with navigation, identifying birds or flowers, checking stream flows, and enjoying the star-scape. Here are a few we recommend. 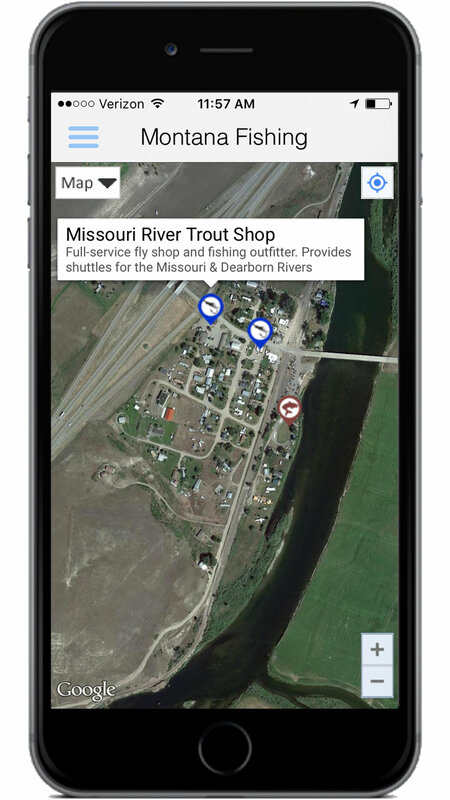 Fishing in Montana this year just got a whole lot easier thanks to a new smartphone app called Montana Fishing, although that’s not to say it will improve your catching. Still, the app, released by Bozeman-based MountainWorks Software, gives anglers critical information about fishing access locations, flow rates and stream temperatures, the types of fish that abound in a particular river and how to identify them, figures about whether the flows have changed significantly, as well as info about nearby fishing shops and shuttle services.